I absolutely believe that the next big area of investment for organizations around the world is going to be in employee experience, that is trying to create a place where employees actually want, not need, to show up to work. For decades organizations have been investing in employee engagement with little results. Unfortunately engagement has been very focused on trying to force employees to work in outdated workplace practices while giving them perks to distract them from their unfortunate situations. Employee experience on the other hand, is about actually changing the workplace practices around the people who work there. This is the only way to ensure that organizations are able to attract and retain the best people. But who are some of the world’s leading organizations when it comes to experience and what exactly are they doing? 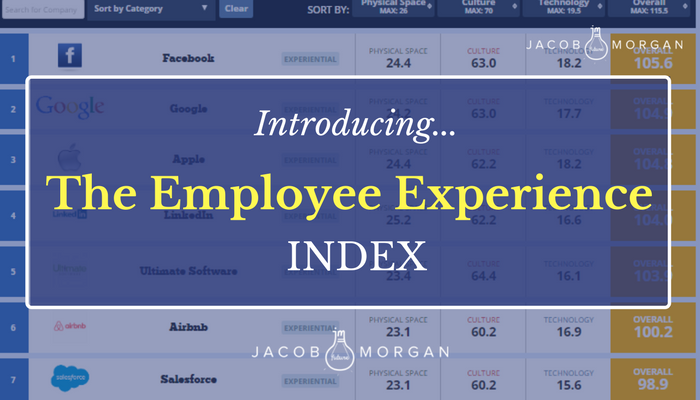 As part of my research on employee experience I developed the world’s first Employee Experience Index which scores and ranks 252 global organizations across 17 variables which are grouped into 3 environments: culture, technology, and physical space. Out of all of the organizations I analyzed, only 6% (15 companies) of them are Experiential, meaning they are doing an amazing job of investing in and designing for these 3 environments. I explored the frameworks and approaches in depth in my new best-selling book, The Employee Experience Advantage: How to Win the War for Talent by Giving Employees the Workspaces they Want, the Tools they Need, and a Culture They Can Celebrate. The ROI of investing in employee experience is significant and translates into higher productivity, profit and revenue per employee, stock price performance, and much more. We all deserve to work for an organization that invests in the employee experience! 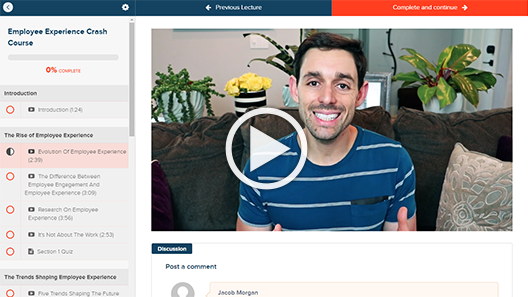 Not only can you view the index but you can also take the survey yourself to see how your organization stacks up.